Click on Journal to view a sample copy. To contribute to knowledge transmission and utilisation that stimulates and encourages praxis - "the action and reflection of people upon their world in order to transform it" (Friere, 1972). To publish research, commentaries and discussion papers related to New Zealand, the Pacific Rim, and Indigenous peoples that are relevant to any aspect of nursing or healthcare practice that has the potential to influence nursing practice. Nursing Praxis publishes material which reflects upon and is relevant to any aspect of nursing practice and which has a nurse or midwife as the sole or principal author. We have a particular interest in research-based practice oriented articles. There is no monetary payment to contributors, but the author will receive a complimentary copy of the Journal on publication. Nursing Praxis in New Zealand is indexed in CINAHL (Cumulative Index of Nursing and Allied Health Literature) publication. 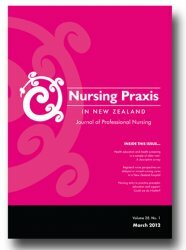 Nursing Praxis is a not-for-profit journal and welcomes sponsorship and donations to assist with publications.